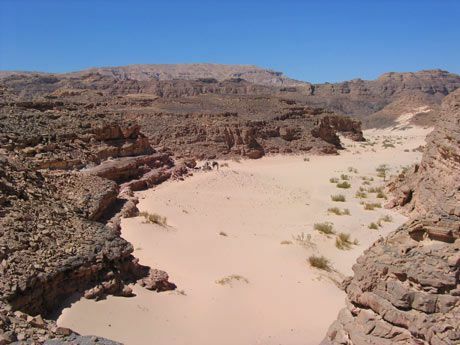 The trails during our safari will take us through wadis (valleys), though oases and over the mountains (Gebel). The journey will take us through ever changing landscapes of different rock formations – the camels will be taking us past a wide variety of colours, shapes and sights. Sometimes it will be necessary to climb the next mountain on foot and not on camel back as camels, when carrying loads, are not quite as sure footed when climbing up- and downhill. The average altitude, at which we travel, will be around 800-1000 meters above sea level. Should a group member fall ill during the trip, we will make sure he/she will be well taken care off. there will be full board during the tour. All meals are cooked over an open fire. There will be morning tea/coffee and freshly baked pita bread (over an open fire) with tahini and cheese. Lunch and dinner will be prepared by the Bedouins (white or red rice, vegetables, salad, potatoes, chicken …). Tea will be prepared with lots of sugar (or, if you prefer, without sugar) and is the main drink. We will of course also cater for vegetarians. Please specify you food requirements upon registration. Sufficient clean drinking water will be provided. During the warmer seasons, coca cola has also proven to be a very welcome beverage. At Mount Sinai we will have day light from approximately from 6 o’clock in the morning to 6 o’clock in the evening. We will start early on most days, travelling during the morning hours, take a good long midday break and will then continue our trip during the latter part of the day. I recommend arrival in Dahab 2-3 days before the 7-day safari starts. You may then acclimatize and enjoy the Red Sea, the wonderful scenery and the restaurants close by the sea. It will give you some time to recover from the stress of everyday life and tune in to an entirely different culture, people and climate. 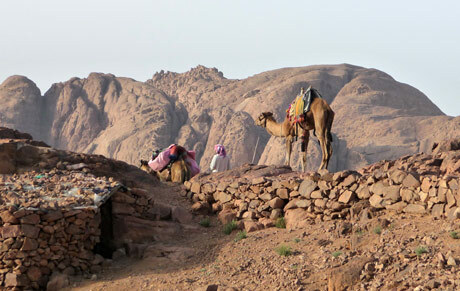 Similarly, a 2-3-day period afterwards will be very useful to wind down, as even Dahab, a friendly little tourist town, will already seem to you to be rather civilized after one week of an individualistic camel safari. Copyright © 2019 sinai-kamel-safari.de • Silhouette theme by Brian Gardner with individual adaptations.